Unrelenting, persistent body odor can negatively affect women's lives, especially as they pass through the menopausal transition. The revolting smell may leave them feeling as if they need to withdraw from social activities or even work to avoid embarrassment. Continue reading to learn more about chronic body odor, including its causes and solutions, so that you can pass through this time feeling forever fresh. There are two main types of sweat glands, eccrine and apocrine glands. Apocrine glands are found where there are hair follicles, such as the armpits and groin, and produce milky fluid when your body is under stress. When combined with bacteria of the skin, body odor develops. There are several situations that can occur during which the body produces excessive body odor that is unrelenting, no matter what you do to manage it. Women passing through menopause are more likely to have changes in body odor for a variety of reasons. For one, they are sweating more due to other symptoms of the transition, such as hot flashes, night sweats, and even anxiety. This extra sweat can lead to excessive body odor if not properly handled. Also, sweat from anxiety or stress smells differently than sweat that is produced when working out. The fatty sweat from anxiety causes a more pronounced odor that bacteria feeds on. 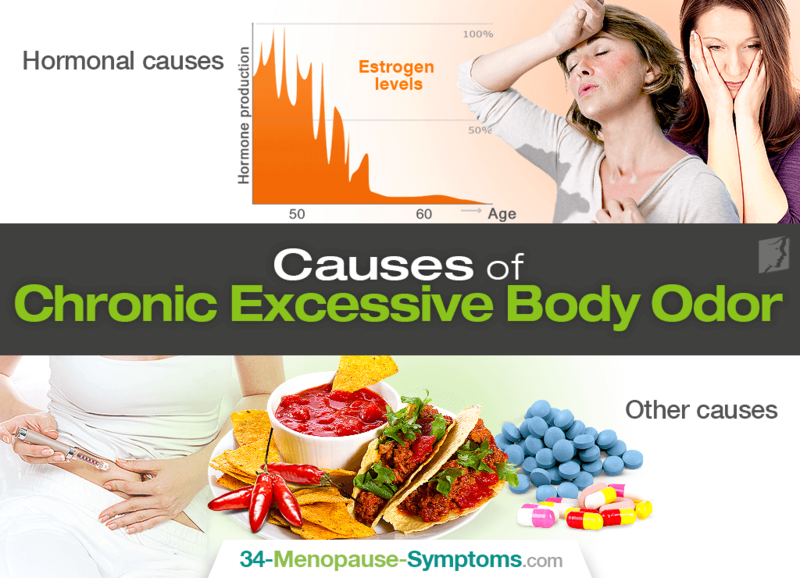 If menopausal women are persistently anxious, this could lead to persistent body odor. Finally, drastic hormonal fluctuations that are taking place in the woman's body can cause odor problems. For reasons not completely understood, estrogen is believed to play an integral role. Other causes of chronic body odor include taking medications, like antidepressants; consuming rich or spicy food and drink; or suffering from certain medical conditions, such as diabetes as well as liver or kidney disease. Using proper hygiene. When suffering from body odor, women should be sure to take proper measure by showering or bathing daily as well as washing and shaving their armpits regularly. Wearing natural fibers. Fabrics like wool, silk, or cotton are breathable materials that allow your skin to breathe as it needs. This means sweat will evaporate more quickly. Washing clothes regularly. If you suffer from chronic body odor, do not wear clothes for more than one or two times before washing them. Elsewise, you will never feel or smell fresh. Limiting trigger foods. Because spicy foods - including curry and garlic - as well as red meats can cause worsen body odor, avoid their excessive consumption. Usually, pinpointing the cause of your persistent body odor and promptly tackling it will bring the greatest relief long-term. For menopausal women, this cause is usually hormonal imbalance. Treatments for changes in body odor focus on starting with less invasive measures, such as implementing wholesome lifestyle habits - many aforementioned - and pairing them with herbal supplements proven to encourage hormonal equilibrium. Phytoestrogenic herbal supplements and hormone-regulating supplements are the two most popularly chosen, yet hormone-regulating supplements have proven safer in the long run. Click on the previous link to learn more. In sum, chronic body odor in menopausal women can be attributed to their excessive sweating from symptoms like night sweats as well as increased anxiety and stress topped off with hormonal fluctuations. If not from these, the persistent smell could also be due to medications, poor food choices, and medical conditions. Aside from management techniques focusing on proper hygiene, wardrobe choices, and dietary restrictions, the most effective way to treat excessive body odor is by targeting the underlying cause of hormonal imbalance in middle-aged women.